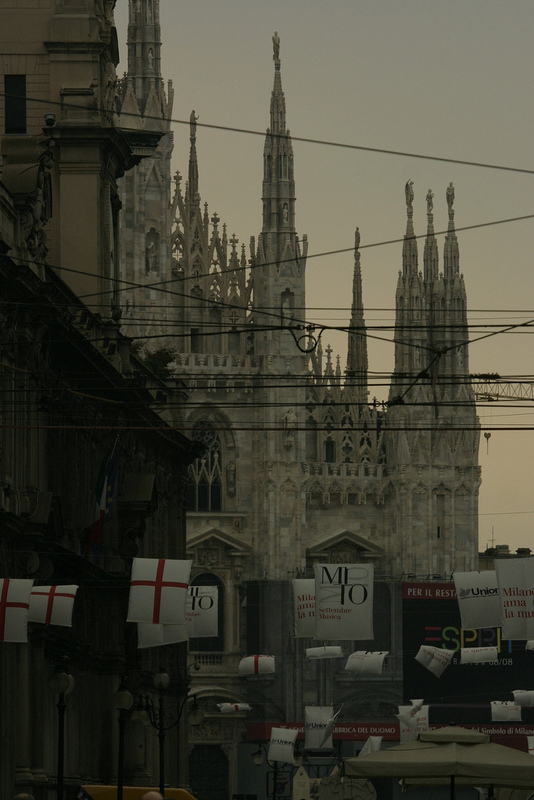 The nice thing to do in Milan is to go somewhere by tram. The city center is covered with the electric net which feeds old and modern trams. Take a ride. Just for a change. To make it really nice and kind of ‘old school’ or ‘vintage’ impression take the old wooden tram which makes a terrible noise. These trams have funny additional step that magically appears when the door is open. Be careful and hold on: these trams may sometimes shake you off. While moving around by subway is efficient and comfortable a ride by tram is pleasant and shows you the city. So, if you have an opportunity to do so, you can’t miss it. The only tricky part is to buy a ticket. It should cost you around 1,30 EUR and I think that in the city center you can even do it in English or by using one of the ticket machines BUT it would be cool to buy it from one of these old guys in a little stand at the corner full of newspapers, souvenirs and AC Milan or Inter scarfs. These guys are often dressed in hundred layers of coats and jackets (at least in winter time) with old fashion hat make the impression that they have been selling tickets and smoking cigarettes for at least 120 years. Continuously. They look like they would know the whole history of the city, remember all of the most disturbing events and if you would just ask them to tell you the story they would have spend two weeks on sharing their memories. Most of the time they are real locals with strong accent and lovely smile. I spend hours on watching their work: you would be astonished with the speed of selling things! Unless you will meet them during a lunch brake: if so, you should choose a ticket machine.